We’re closing in on the end of the year, which means it’s almost time for family, friends, travel, stress, fun, and everything else that comes with holiday season. It’s also a great chance to take stock of your financial situation, reflect on what’s gone well this year, what could be improved, and what you need to do to put yourself in the best situation possible going into next year. But let’s face it: you don’t want to spend the holidays handling your finances. That’s no fun for anyone. So instead of waiting until the last minute, and potentially missing some important deadlines, I’d like to help you get a bit of a head start. 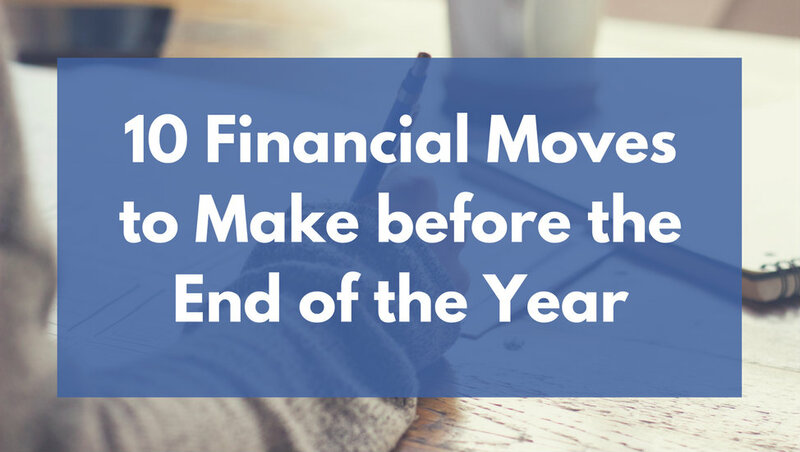 Here are 10 moves you can start making right now to improve your financial situation before the end of the year. What hasn’t gone well? Why is that? Are these goals still relevant? Do any of them need to be discarded or updated? Are there any new goals you’d like to be working towards? What are some specific steps you can take to make better progress going forward? Block some time off in your calendar to review those goals, update them as needed, and set new goals for the coming year. Your life and your circumstances have almost certainly changed over the past 12 months, and your goals should reflect those changes. In the end, your financial plan can only be as good as the goals you set. Make this review a priority, block the time off in your calendar, and set yourself up for success in the coming year. The easiest way to reach financial independence as soon as possible is to save more money. Nothing else you do will have as big an impact. So it makes sense to take stock of how much you’ve already saved this year and whether you should be making any special moves to maximize your contributions to accounts like your 401(k), IRA, and HSA. There are some limits and deadlines to consider here, so let’s walk through them quickly. 401(k) – The most you can contribute to your 401(k) in 2018 is $18,500 and you have until December 31 to do so. Reach out to your HR department if you would like to increase your contributions between now and then. IRA – The maximum IRA contribution for 2018 is $5,500, though there are some limits depending on your income. And while you have until April 15 of next year to make those contributions, it’s a good idea to at least have a plan in place now. (Here’s a guide to help you decide the right type of IRA for you: Traditional vs. Roth IRA: The Unconventional Wisdom. HSA – Don’t forget about a health savings account, which is quite possibly the best investment account around! A family can contribute up to $6,900 for 2018 while an individual can contribute up to $3,450. Here’s a guide that will help you set one up: How to Find the Best Health Savings Account. If you’re self-employed, or even freelancing on the side, think about opening a retirement account through your business. That extra savings can be really powerful. With both your goals and your savings still top-of-mind, you’re in prime position to make a least a rough savings plan for next year. But of course financial independence shouldn’t be your only goal. Back in Step 1 you might have set goals like buying a house, traveling, building an emergency fund, switching to a single income, or starting a business. Those shorter-term goals are just as important as the long term ones, so make sure to set aside some regular savings for those as well. The end of the year is open enrollment season, which means your employer will probably be sending you a big packet of information about your 2019 employee benefit options. That might sound pretty boring, and it kind of is, but it’s also a big opportunity to make sure you grab every last financial incentive available to you. Retirement plans – Have there been any new plans introduced? Are there any changes to the old plan? Are you taking full advantage of your employer match? Health insurance – Check both your options and (if applicable) your spouse’s options to make sure you’re getting the right coverage for your family’s needs. You may even be able to choose a plan that qualifies you for a health savings account! Dental and vision insurance – This can be valuable coverage, especially if you know you’ll need care in the coming year. Medical FSA – Money contributed to this account is tax-deductible and can then be used tax-free for medical expenses. Just be cautious because this money is, in many cases at least, use it or lose it. The maximum annual contribution for 2019 is $2,700. Dependent care FSA – Money contributed to this account is tax-deductible and can then be used tax-free for childcare expenses. Hey, at least there’s SOME relief from this enormous cost! Though again, this money is use it or lose it so plan carefully. The maximum annual contribution for 2019 is $5,000. Life and disability insurance – There are pros and cons to getting this coverage through work, but at the very least it’s good to know what’s available to you so you can make an informed decision. Legal services – You may be able to take advantage of heavily discounted legal services, which can range from estate planning, to immigration assistance, to family law. Other perks – There’s a whole range of other perks your employer might offer, such as gym membership, transportation reimbursement, education assistance, and many others. Make sure to look through all your options so you can take full advantage of everything that’s available to you. One of the tricky parts of a medical FSA is that the money is often use it or lose it. That is, any money that’s still in your account at the end of the year is gone forever. So, while there’s still time left, check your FSA account balance and think about how you might be able to use it before the end of the year. Do you need new glasses? Do you have any medical care you’ve been putting off? Maybe your child could use a trip to the dentist? See if you can find a use for this money before the end of the year so that it doesn’t go to waste. Quick note: Not all FSA plans are 100% use it or lose it. Some offer a grace period where you’re allowed to use the money for a certain period of time after year end. Others will let you keep up to $500 for next year. Check your specific plan details to see what leeway you’re allowed here. The holidays can be a lot of fun. Time off from work. Time with family. Maybe even some traveling. They can also be a HUGE money drain. Between gifts, food, plane tickets, hotels, and all the rest, the money you spend during the holidays can throw you way off your other goals, and potentially even leave you with a new pile of debt to handle. The best way to avoid all of that is to plan ahead. Make a plan for how much you want to spend. Set a gift budget, a food budget, and a travel budget. Save ahead for the things you know are coming. I’m all for traveling to see family and spending on things that matter. And the holidays are a great opportunity to do just that. With a little bit of planning, you can do it in a way that keeps your other goals on track. I like to be pretty hands off with my investments. As long as you pick a good enough investment strategy, minimize your costs, and automate your savings, you should stop worrying about it and get back to the rest of your life. But there IS a small amount of regular maintenance that helps keep things on track, and rebalancing your investments is one of those pieces. You chose to invest in a particular way with a particular mix of investments. This much money in stocks, that much in bonds, etc. But over time the markets will move and that mix will naturally change. When the stock market is up, that part of your investment account will increase in value and you’ll have a bigger percentage of your money in stocks than you originally planned. The opposite is true when the stock market is down. Rebalancing is how you bring everything back in line with your personal goals. It’s simply the process of resetting your investments back to your original plan. Here’s more detail on what rebalancing is and how to do it: What is Rebalancing and Why is it Important? Of course, there are also a number of investment options that automate the process of rebalancing so that you don’t have to worry about it. Here’s more on that topic: How to Beat 80% of Investors With 1% of the Effort. Life moves fast, and as your circumstances change you may find yourself with new things to protect, or maybe even things that no longer need protection. Which means it’s a good idea to review your insurance and estate plan from time to time to make sure it’s still covering what you need it to cover, and nothing more. Life insurance – A change in circumstances, such as a new child, a new house, a windfall, a marriage, or a divorce can significantly change your need for life insurance. If you’ve been through any big changes, you can use this tool to re-evaluate your need for coverage. Disability insurance – If you’ve changed jobs or had a significant change in income, you may need to update your coverage to make sure you’re fully protected. Estate plan – The same changes that would trigger a review of life insurance should trigger a review of your will and other estate planning documents. This is simply to make sure that your family will always be cared for in the way you want. Do any of the numbers surprise you? Were there any irregular expenses you hadn’t planned for? Did you save for the things you wanted to save for? Are there any expenses that would be easy to cut? Do you see any opportunities to increase your income? Do you have room to put more money towards more enjoyable activities? There’s nothing like looking at the cold, hard numbers to get a real sense of where your money is going, what you’re prioritizing, and what you’d like to change. If you haven’t been tracking your spending, now is as good a time as any to get started. I would highly recommend checking out You Need a Budget to help you take control of your income, expenses, and savings. Your net worth is your single most important financial number for the simple reason that just about every good financial move you make serves to either increase it or protect it. And that means that tracking your net worth over time will help you gauge whether the financial moves you’re making are actually working. If your net worth is increasing, you’re making progress. If not, it might be time to re-evaluate the decisions you’re making. So no matter what, recording your net worth now is a good idea. And if you can, compare it to your net worth at the same time last year to see how it’s changed, think about what worked and what didn’t, and use that information to influence your plans for the coming year. Here’s an article that explains how to do that: The Most Important Financial Number. What will you do to improve your financial situation? You certainly don’t have to hit all 10 of these by the end of the year (though it would be great if you did!). That’s a lot to take on. But as you look at this list, try to find at least 2-3 things that you can commit to handling before December 31, and maybe another 2-3 that you can commit to at the start of next year. This isn’t about getting EVERYTHING right. It’s about making consistent forward progress one step at a time. Great tips! As someone working in payroll, I usually get a lot of questions from employees around this time about maxing out their HSA or realizing their federal or state withholdings weren’t what they thought they’d be. Also, employees age 55 and up also have a catch-up amount allowed for their 401k and HSA. Thanks Elizabeth! And yes, good point about the catch-up contributions. It’s actually allowed for those age 50+ for 401(k)s and IRAs, and age 55+ for HSAs. And the additional catch-up contribution is $6,000 for 401(k)s, $1,000 for IRAs, and $1,000 for HSAs. Great reminder Matt. We have a few short term goals that need some attention. You’re right they’re just as important as saving for retirement. And nice to see the 401k contribution limit got a little increase for 2018! Congrats on all the progress you’ve made Cassandra! Those are big steps that set you up very well going forward. Good luck with everything and please don’t hesitate to reach out if there’s anything I can do to help. The end of the year is a perfect time to plan. From these ten steps, I particularly like steps one, three and nine because they allow me to benchmark past actions against my goals. This way I can look at the whole picture and avoid fooling myself with vanity metrics.